“Mom, can we go see ‘Into the Spider-Verse,’ again?” my nine-year-old son asked me as I was tucking him in to bed the other night. And I was happy to hear his request. I’d been thinking about how much I wanted to revisit the film for days after the screening we’d attended, myself—not only because it’s such a pure blast of creative joy, but also because there’s so much going on that a viewer couldn’t possibly catch it all the first time around. It’s only fitting that my kid would be thinking about “Spider-Man: Into the Spider-Verse” as he was drifting off to sleep. As rooted in a vividly specific, recognizable New York as it is, and as closely as it hews to comic-book imagery and structure within its animated format as it does, “Spider-Verse” has a wonderfully trippy, dreamlike quality about it. And that’s not just because it features a wisecracking pig in a Spider-Man get-up named Peter Porker, the kind of character you might conjure in your subconscious after eating too much barbecue and taking a shot of Nyquil before bed. It would seem like an impossible feat, but somehow, directors Bob Persichetti, Peter Ramsey, and Rodney Rothman have breathed thrilling new life into the comic book movie. The way they play with tone, form and texture is constantly inventive and giddily alive. Given that we get a handful of Marvel films every year—and we’ve certainly had no shortage of movies featuring Spider-Man among them, either as a main character or as part of an assembled ensemble—the idea of yet another might sound like overkill or worse: a shameless cash grab. But “Into the Spider-Verse” is after something different, both in its storytelling and in its stakes. And it knows that you know all the various incarnations of this character, and might even be tired of them yourself. The screenplay comes from Rothman and Phil Lord—one half of the brilliant team behind “The LEGO Movie” (alongside Christopher Miller), which also played in myriad meta ways with the audience’s knowledge about and expectations of ubiquitous pop-culture characters. It features plenty of fourth-wall breaking and self-aware narration, both of which might seem like trite crutches in less clever hands. These are comic-book characters that know they’re comic-book characters, which in no way diminishes the excitement of their adventures. On the contrary, this device welcomes us even more powerfully into their world. It helps hugely that “Into the Spider-Verse” features a tremendous cast of voice actors to bring these characters to life. They hit the humorous beats with superb timing and élan, but they also find the humanity and pathos within their adventures to give the story dramatic heft. Familiarity with this parallel universe of Spider-Man characters isn’t necessarily a must. I didn’t really know any of them going into it, and I had a blast, but my son had seen them in various TV shows he’s watched and video games he’s played, which added a level of excitement with the introduction of each one. 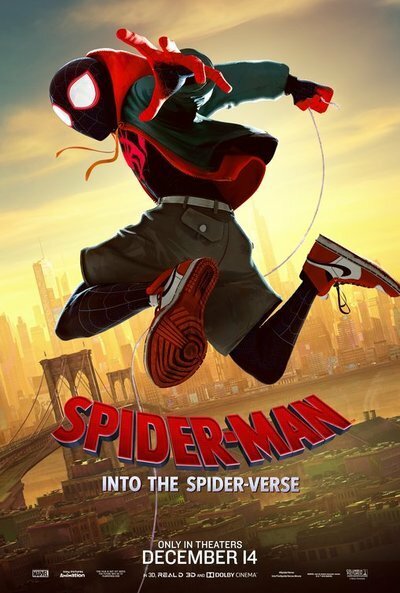 At their center is Miles Morales (voiced with heart and smarts by “Dope” star Shameik Moore), an ordinary Brooklyn teenager who undergoes an extraordinary transformation when he gets bitten by a radioactive spider. The streets and brownstones, cabs and subways of his daily life have a detailed, tactile realism about them, but also the heightened aesthetic of a comic book come to life, complete with panels and dialogue bubbles. It’s simply gorgeous. As was the case with his Queens counterpart, Peter B. Parker (Jake Johnson), the newfound powers Miles discovers are simultaneously terrifying and exhilarating. These characters, and the various others we meet in the Spider-Verse, introduce themselves in cheeky fashion, going through the familiar steps of their own respective spider bites in playful, knowing ways. The high-energy repetition of this well-worn origin story, in all its wild permutations, is a consistent source of laughs. Whereas Miles is young, eager and full of promise, the version of Peter Parker he eventually encounters is middle-aged, jaded and paunchy. It’s an inspired new angle into this iconic superhero, and Johnson finds just the right combination of sarcasm and sadness in his reluctant mentor figure. But wait, there’s more—so much more. Because Miles and Peter aren’t the only Spider-men out there. When megalomaniacal crime lord Wilson Fisk (Liev Schreiber) builds a super collider that tears a hole in the time-space continuum—or something—various Spider-beings from other dimensions come tumbling out. They include the elegant and acrobatic Gwen Stacy/Spider-Woman (Hailee Steinfeld), who poses as a student at Miles’ school; Nicolas Cage’s Spider-Noir, a black-and-white, hard-boiled detective; the anime-inspired Penni Parker (Kimiko Glenn), who fights crime with the help of her friendly robot; and the aforementioned Peter Porker, a.k.a. Spider-Ham (a perfectly cast John Mulaney), who steals his every scene. Previously, we’d already met another more traditional Spider-Man within Miles’ timeline, voiced by Chris Pine. And among the other characters we’re familiar with, we see Peter’s longtime love, Mary Jane (Zoe Kravitz); his reliable Aunt May (Lily Tomlin); and legendary nemeses including Doc Ock (Kathryn Hahn, in a great bit of gender-bending casting). The always-excellent Brian Tyree Henry and Mahershala Ali respectively portray Miles’ father and uncle: two very different figures who have had an enormous influence on the intelligent, resourceful young man Miles has become. Luna Lauren Velez voices his warmly supportive mom, Rio. Yes, it’s dizzying, and that’s part of the fun. But the characters are drawn so distinctly that they’re always compelling. And we come to care about them because they’re not cogs in a massive machinery where the fate of the entire universe hangs in the balance, as is so often the case in behemoth comic-book blockbusters. More intimately, their individual worlds are at stake, and the possibility that these characters will never be able to go back to the dimensions they call home. They fear being stuck in the purgatory of a madman’s making, an understandable cause for existential dread. They all bounce beautifully off each other as they banter, draw from their strengths and learn to work together. It’s pretty linear from a narrative perspective, for a while. But then the climax unfolds, in which they fight for survival and a return to their own realms, rendered as a psychedelic explosion of color and style. What’s amazing is that this lengthy sequence is never hard to follow. We’re with it every breathless step of the way, which can’t always be said for live-action, CGI extravaganzas of this ilk. So yes, we can see it again. And we will. And we’ll stay all the way through the credits again—and you should, too.